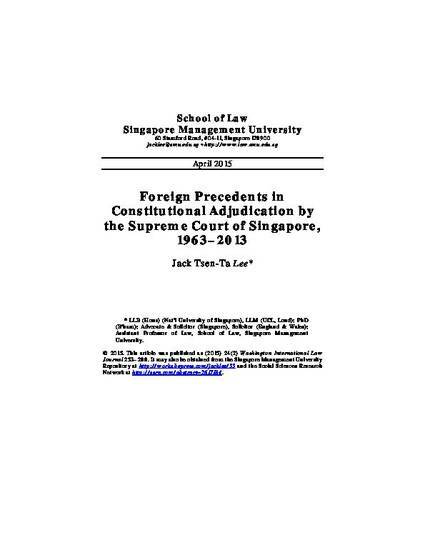 This article surveys the use of foreign precedents in constitutional adjudication by the Supreme Court of Singapore for over a half century during the terms of the first three Chief Justices—Wee Chong Jin (1963–1990), Yong Pung How (1990–2006), and Chan Sek Keong (2006–2012)—and the first year in office of the fourth Chief Justice, Sundaresh Menon (2012–2013). It concludes that while judges have always cited foreign case law, they have only actually applied foreign cases where the wording of the Constitution and the constitutional arrangements in Singapore are fairly analogous to the constitutional texts and arrangements upon which the cases were decided. Sometimes, Singapore judges quoted passages from cases in an instrumental manner to support statements of law without necessarily analyzing in detail the reasoning underlying such cases. There were also instances where foreign jurisprudence was rejected on the basis that it related to constitutional texts that were worded differently from the Constitution. In recent times the courts have been more willing to examine why foreign courts arrived at certain results, but this has not necessarily led them to adopt the same conclusions those courts reached. It is likely that the courts’ choice of which foreign precedents are followed or rejected will depend on whether they remain deferential to the policy choices of the political branches of government, or develop constitutional principles to subject these choices to greater scrutiny. © 2015. This article was published as (2015) 24(2) Washington International Law Journal 253–288. It may also be obtained from the Social Sciences Research Network at http://ssrn.com/abstract=2617184.